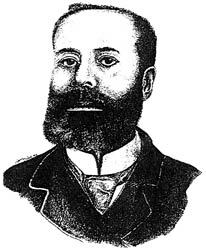 Elijah McCoy was born in 1843 in Colchester, Ontario. His parents escaped slavery in Kentucky via the Underground Railroad. At age 15, he was sent to Scotland to study engineering; upon his return to Canada, the only job available was railway fireman (stoking the engine's furnace with wood). It was during this time that his mind started to look for better ways to do things. Fascinated by steam engines, McCoy noticed that machines had to be stopped every time they needed oil, which was expensive and wasted a lot of time. In the 1890's, he invented a device to oil the machinery while it was working. It was soon used on engines and train locomotives, on Great Lakes steamships, on ocean liners, and on machinery in factories. His invention became so popular that no engine or machine was considered complete until it had a McCoy Lubricator. The phrase "real McCoy" soon caught on as a way of saying that people were getting the very best equipment available. By 1923 McCoy was known throughout the world. His inventions were patented in Great Britain, France, Germany, Austria, and Russia as well as in Canada and the United States.